Spending time in the outdoors as a family this fall can be both fun and educational: get some exercise, explore Marin County's many parks and open space preserves, take advantage of our often lovely fall weather, and learn about the natural wonders that can be found all around us. A fantastic and eye-opening way to get out and experience nature in Marin is to take part in one of the naturalist-led family outings offered by Marin County Parks. The parks department's Nature for Kids outings take place at Marin's many open space areas, and feature a leisurely, kid-paced hike with plenty of opportunities to stop and explore along the way. The hikes are informal and unstructured, and perfect for kids of all ages, although they seem geared for kids ages 3 to 12. Led by experienced, knowledgeable, and personable naturalists, these hikes allow everyone in the family to get up-close-and-personal with insects, reptiles, spiders, birds, and other flora and fauna that call Marin County home. The programs are really fascinating and will make you look at our open spaces in a completely different way. If you haven't taken advantage of one of these programs yet, you should really think about doing so—after all, they're absolutely free to attend. Upcoming Nature for Kids outings for winter and spring 2019 include a visit to Ignacio Valley Preserve on Tuesday, February 19, exploring wet weather wonders at Indian Valley Preserve on Sunday, March 10, and a walk through a springtime forest at Indian Tree Preserve on Monday, May 27. There is usually at least one Nature for Kids Hike per month; check their calendar for a complete schedule. All Nature for Kids outings begin at 10 am and last approximately three hours. 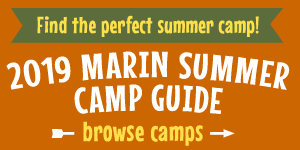 For more information, visit the Marin County Parks website. You can also contact Shannon Burks for questions at (415) 893-9520 or sburke@marincounty.org. Nature for Kids outings involve a hike, so make sure everyone wears sturdy shoes and clothes that you don't mind getting dirty. Hats and sunscreen are always a good idea, and dress in layers so you're prepared for any kind of weather. Make sure you bring plenty of drinking water, and pack a lunch and snacks. Most Nature for Kids hikes run from 10 am to 1 pm, and there will be a break for lunch about halfway through. Other things to bring include your camera and binoculars if you have them. Nature for Kids outings are perfect for kids of all ages, but those from about 3 to 12 will probably get the most out of them. Strollers of the sturdy offroad variety are welcome, too, although their suitability depends on the terrain. Dogs, with the exception of service animals, are not allowed on naturalist outings like these. Rain or other heavy weather may cancel; call (415) 893-9527 on the morning of the event for a recorded message to see if it's been cancelled.